We are a renowned manufacturer of compactly designed and free standing Lobby Board. These are known for their sturdy construction, perfect finish and are easy to use and portable and find its application for displaying the information in reception area of any organization. 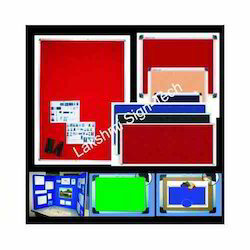 These specially designed lobby board are used for hotels & receptions etc and are available in red, green, black, maroon, blue & navy blue colour. We offer these products in competitive prices and with an assurance of quality at par. We manufacture technologically superior and splendidly engineered Pin Up Board. Outstanding features of our pin up board are rich design for low maintenance wide variety of models to suit all needs high durability and long life guarantee meeting all safety and quality standards. Looking for Lobby Board ?